Wow I am so amaze about this beautiful piece of jewelry. First I love the shine to it, silver just have that shine and look that just goes with a lot of your fashion. 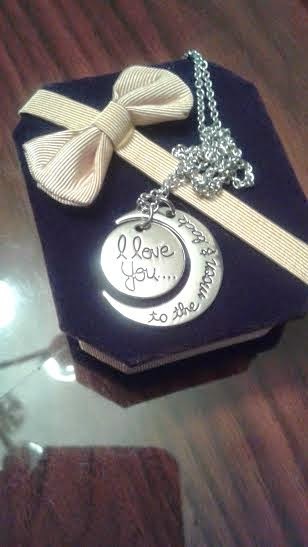 The pendant has engraved on it “I love you to the moon & back” It such a beautiful saying. It is a fine silver medal with a crescent moon and what I love about it is that the pendant has the engraves on both side so you can switch if you like the moons to face the left or right directions. It came with a 23.6″ necklace which is nice and long for you to wear. 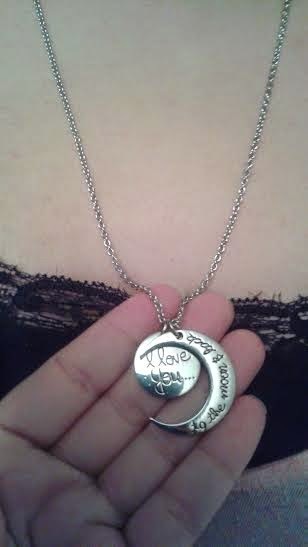 Also because it has the two little round hooks that goes on the necklace you can exchange the necklace if you like. As soon as I seen graceful and unique necklace I knew I had to give it to my daughter, well she is the only daughter I have so with this beautiful crafted pendant I had too. So I told her I had something for her and as soon as I gave it to her she automatically looked at me and scream how did you know, did you looked at my wish list and I said no I didn’t even know you had one.. I guess she already had seen this necklace and wanted it..I am a happy mother just to see my daughter’s face with a beautiful emotion of happiness. It also came in this beautiful box that she can put it away when she goes to sleep or decides to take it off. This is how the necklace looks on her. It is nice and beautiful with such a nice shine to it. 20% Off Ray-Bans, OshKosh B’gosh + Lego Collection on Sale at zulily!